Usually when we think of Civil Services and Defense in one line, the service that comes to mind is Indian Police Service (IPS). However, the risk of life in IPS is also not hidden from anyone. Therefore, usually it remains a tough thing for aspirants to obtain the permission of joining IPS from their families. But did you know that you can still have the best of both worlds without joining the IPS? That’s right, you can have it through Indian Ordnance Factories Service (IOFS). Interested? Then read on to learn more. The services we’re talking about revolve around the defense equipment manufacturing industry of India. When you join any of the ordnance factories in India through IOFS, you get a chance to work with people from some of the most reputed institutions and research organizations of the country (i.e. IITs, IIMs DRDO etc.) to develop state of the art defense equipment.You get to be the force behind armed forces that safeguard our borders. The pride that comes with IOFS services can’t be explained in words – it can only be experienced from inside by working there. 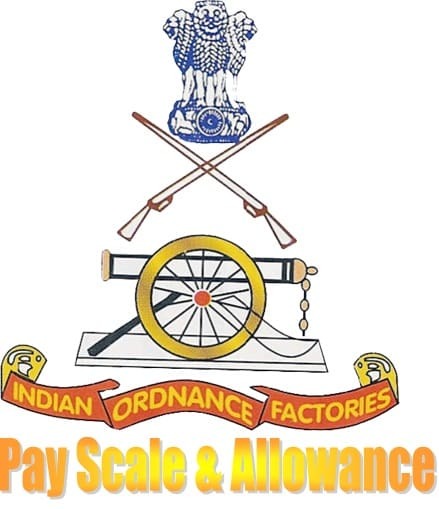 Designations:The highest designation in ordnance factories is that of Director General of Ordnance Factories (DGOF), who acts as the Chairman of Board. Below Chairman they include 9 Additional DGOFs in the board, 5 of whom head various operating divisions of the factories while remaining four manage Personnel (Per) functions, Staff functions, Technical Services (TS) and Planning and Material Management (P&MM). Together these 10 members constitute the Apex Board of Ordnance Factories known as Ordnance Factories Board or OFB. Grade Pay for officers of HAG, HAG+ and Apex grade is Nil. For other grades it varies, as you’ll see in the table given below. The Pay Scales of IOFS are same as scales of all other Civil Services. The 10 members of OFB discussed above are paid at the Fixed Pay Scale of Rs. 80,000. Then there’re Higher Administrative Grade+ officers who’re paid according to HAG+ scale of Rs. 75,000 – Rs. 80,000, and after them there’re Senior General Managers/Senior Principal Directors who’re paid at the HAG scale of Rs. 67,000 – Rs. 79,000. Pay scales of other grades are given in the table below. All the allowances that’re paid to various Civil Service employees are paid to IOFS officers as well. The bills of their phone, internet, newspaper, cable TV, gas and electricity are reimbursed by the government. Fuel allowance is also provided for personal vehicles. However, these allowances remain available to the officers and their family only until they keep working in their positions. Residential Facilities: Some old factories that were built during British governance have got residential colonies with sprawling bungalows, some of which are better than the bungalows of IAS officers even. Canteen Stores Department (CSD) Facilities: From toothpaste to suitcase, pretty much everything that you may need for living your life can be bought from the CSD canteens of these factories on highly subsidized rates. Deputation Facilities: Since IOFS is a participant of Central Staffing Scheme (CSS), its officers can move to any agency, organization, institution or even ministry on deputation basis. They can choose the post or organization of their choice depending on their educational qualifications or interests. Medical Facilities: OFB operates its own dispensaries and hospitals across India where its officers or their family members can have their health examinations free of cost.For some reason if any medicine or medical facility is not available at the OFB hospital then officers can get that facility from any private hospital and its cost will be borne by the government. These medical facilities remain available to officers even after their retirement under CGHS scheme. Education Facilities: Government provides each factory a regional medium school, a Kindergarten English medium school and a Kendriya Vidyalaya. Therefore, IOFS officers can easily provide quality education to their children. Travel Facilities: Officers can travel either via Railways 1st Class or Economy Class flights whenever they need to. Lodging facility is also provided at Inspection Houses or Guest Houses of OFB, and if it’s not available in any city then officers can stay at any other Government transit facility or hotel (up to 5-star hotels) whose bill is reimbursed. Moreover, a Leave Travel Concession (LTC) is also provided to officers after every few years that they can use to travel with their families on all-expenses-paid trips to any location in India. Aside from these major facilities a variety of shopping, recreational and other facilities are also provided to OFB officers. Attractive raise in compensation recommended for the officers of other civil services will be provided to IOFS officers as well. So their benefits are likely to multiply after implementation of 7th CPC.